One of the most amazing botanical myths is that of a tree that had barnacles that opened to reveal geese. The legend of this tree was of great antiquity, and although Albert Magnus in the 13th century denounced it as false, the tales of this tree were popular among herbalists up until the 18th century. William Turner, a 16th century English herbalist accepted the idea, as did John Gerard in his Herball, or Generall Historie of Plantes, published in 1597, in which he wrote: "...there is a small llande in Lancashire called the Pile of Foulders...whereon is found a certaine spume or froth, that in time breedeth unto certaine shels." 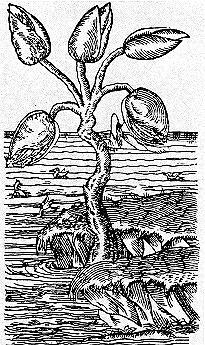 These mussel-shaped shells would grow until they split open, revealing "the legs of the Birde hanging out...til at length it is all come foorth." The bird would hang by its bill until fully mature, then would drop into the sea "where it gathereth feathers, and groweth to a foule, bigger than a Mallard, and lesser than a Goose."